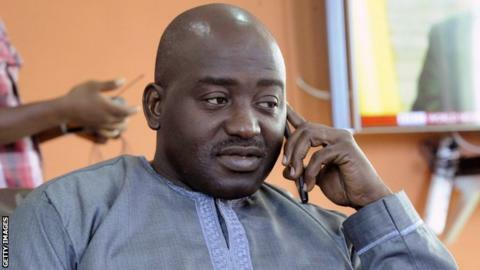 Fifa presidential hopeful Musa Bility has called for February's elections to be postponed in light of the criminal proceedings against Sepp Blatter. The Liberian FA president has also called for the immediate suspension of both Blatter and Michel Platini. On Friday, the Swiss Attorney General said the Fifa president was suspected of criminal mismanagement or misappropriation and of a "disloyal payment" to Uefa head Platini. "Those in charge of Fifa are no longer fit to organise credible elections," Bility told BBC Sport. "To put Fifa through an election at this very point is to set a template for another disaster. "I am calling on the current leadership of Fifa to immediately host an extraordinary congress where the mandate of reform will be given to a neutral body, a neutral set of people." Blatter - who has denied any wrongdoing - has been accused of failing in his fiduciary duties when selling World Cup broadcasting rights for a fraction of their worth to discredited former Fifa official Jack Warner in 2005. Swiss authorities also have questions about the disloyalty payment of two million Swiss francs ($2m) paid to Platini in 2011, for work allegedly carried out between 1999 and 2002. "Concerning the payment that was effected in my favour, I want to clarify that this amount was paid for work that I carried out in a contractual manner for Fifa," Uefa president Platini said in a statement on Friday. "I am pleased to have been able to clarify this point with the authorities." With Blatter under investigation and European football chief Platini now facing questions as well, Bility believes Fifa can no longer hold its presidential elections on 26 February. So far, Platini and Bility have been joined by Chung Mong-joon of South Korea and Prince Ali of Jordan - both of whom are former Fifa vice-presidents - in announcing intentions to be the next president. Former players Zico (Brazil), David Nakhid (Trinidad and Tobago) and Segun Odegbami (Nigeria) have also expressed an interest in replacing Blatter. Candidates must have the backing of five Fifa associations by 26 October to be able to stand, whereupon they will be subjected to a vetting procedure. Bility believes elections should not take place until separate investigations by the United States, into general Fifa corruption, and Switzerland, probing potential corruption surrounding bids for the 2018 and 2022 World Cups, have revealed all the names of those under suspicion. "Right now, it is about us knowing who is actually clean and who is not," said Bility, who has led his FA since 2010. "The president and the secretary general are now under investigation and we don't know who else will follow. "It cannot continue like this. This is the crisis that must change football. We must not now allow a good opportunity to go to waste." The scandal surrounding Fifa exploded in May, when 14 football officials and sports marketing executives were indicted. Seven were arrested by Swiss police in a dawn raid on a Zurich hotel. Should Blatter be suspended from his duties during the Swiss investigations, Cameroon's Issa Hayatou would assume control of football's world governing body. The Confederation of African Football chief is the most senior vice-president in Fifa. "I expect that to happen immediately and for Hayatou to call for an extraordinary congress, where the reorganisation and reformation of the organisation can then take place," added Bility. "At this time, Fifa has lost the moral authority to organise anything such as reformation or elections."